Abang Johari (centre) receives the JCI Gold Seal accreditation certificate from Bujang while Dr Au Yong looks on. KUCHING: Quality services and international standard compliance offered by hospitals, especially private hospitals, can help in spurring medical tourism in the state. 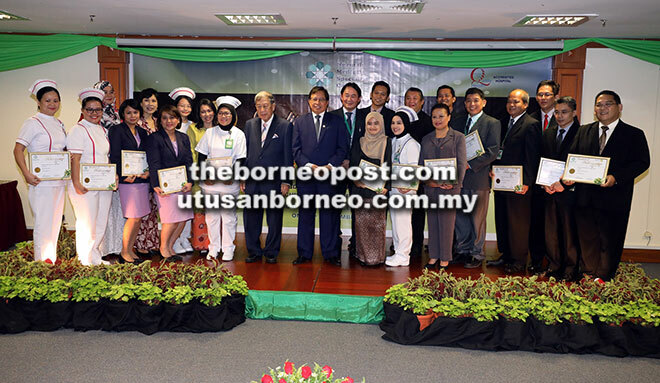 Chief Minister Datuk Patinggi Abang Johari Tun Openg, in saying this, thus encouraged private hospitals in the state to improve their service standard as part of commitment to deliver quality healthcare to their patients. “Your clients will come and see you if your service is of quality from day one. When the quality service is there, people are attracted to you and they will come to see you. People are willing to go even to the extent of paying more for the quality services. “If they see your service is good, they will come again. Your reputation is your brand. Once you have the brand, people will come to you,” he said when officiating at the presentation of a Joint Commission International (JCI) Gold Seal accreditation certificate at Normah Medical Specialist Centre here yesterday. Abang Johari said the key for all the service providers including hospitals was that they must provide good and quality service to their customers, adding that it’s also equally important for hospital staff such as doctors and nurses to make great impression with their patients to assure them they were in good hands at the hospital. “Although Sarawak does not have many direct flights to international destinations, we still receive many tourists which goes to show that our tourism industry is developing. “When our tourism industry develops, the medical tourism will also develop. That is why we see many hospitals coming up here at this time. Initially, it was only Normah, then came along KPJ Kuching Specialist Hospital, Timberland Medical Centre and then Borneo Medical Centre. In Sibu, we have Rejang Medical Centre. He also called on the medical profession in the state to embrace technology, stressing that with the latest technology, medical procedures like heart surgery could be simplified without patients having to go through an open heart surgery. 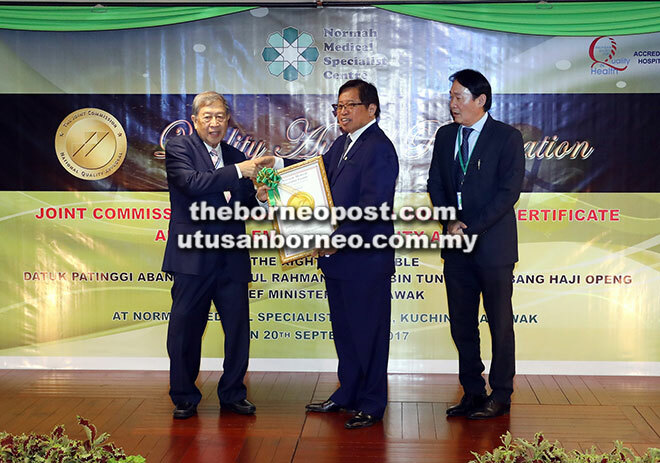 On Normah Medical Specialist Centre being a JCI Gold Seal accredited health care organisation, Abang Johari said this was Normah’s achievement for complying with international standard. Abang Johari also presented Normah Medical Specialist Centre Quality Award 2017 to 20 of the hospital’s staff. Abang Johari’s wife Datin Patinggi Datuk Juma’ani Tuanku Bujang, Sarawak Medical Centre chairman Tan Sri Datuk Amar Bujang Mohammed Nor, Normah Medical Specialist Centre chief executive officer Datu Dr Au Yong Kien Hoe and Assistant Minister of Transportation Datuk Dr Jerip Susil were also present.